Angela Hall, our 2018 RCN Nurse of the Year, has ‘pushed the boundaries for her patients’. Ms Hall with patient the Rev Mark Bond. Ms Hall explains the use of vernakalant to treat patients with rapid onset atrial fibrillation. Ms Hall introduced heart drug vernakalant to her hospital. Patients can now be discharged from hospital much earlier than before. Ms Hall with consultant cardiologist Andrew MItchell. Ms Hall works in the rapid access arrhythmia clinic and nurse-led cardioversion service. Ms Hall was nominated for the Nurse Awards by her colleague Kellyanne Kinsella. Angela Hall’s colleagues will tell you that it’s her determination and hard work that have transformed the care of patients with heart rhythm disorders at Jersey General Hospital. Arrhythmia nurse specialist Ms Hall established four impressive innovations in 12 months, slashing waiting times for hundreds of patients and dramatically reducing costs – a feat that has earned her the title of RCN Nurse of the Year 2018. Yet for her patients, her strengths are undoubtedly the way she builds rapport with those in her care and goes the extra mile when they feel vulnerable. Patient Kevin Lynch describes her as ‘like a ray of sunshine’. ‘She makes the whole experience of having a heart condition a lot easier to deal with,’ he says. 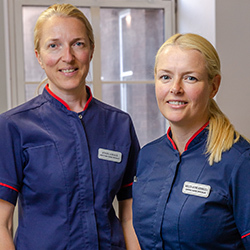 Ms Hall was announced winner of the profession’s top accolade at the glittering RCNi Nurse Awards ceremony in London on 4 July, after having won the Innovations in your Specialty category earlier in the evening. The judges say her enthusiasm shone through as she talked about her work. In the same year that Ms Hall set up three clinics, she also drove the introduction of a drug that had never been used in the UK before, significantly improving the management of patients brought to the emergency department with atrial fibrillation. ‘By streamlining patient care we have improved patient experience and reduced the negative impact that can develop when arrhythmias are not detected or treated in a timely manner,’ says Ms Hall. Ms Hall’s first innovation was a nurse-led rapid access arrhythmia clinic, which has dramatically improved assessment times. In 2017 it received 507 mainly new referrals from GPs, the emergency department and cardiology. Before the clinic, patients had a nine-month wait for an appointment at the cardiology outpatient clinic, then a further five-month wait for follow-up. Patient management was varied and there was high pressure on inpatient beds and the emergency department. At the clinic, advanced nurse practitioner Ms Hall is responsible for history-taking, clinical assessment, non-medical prescribing, diagnostics, interpretation and management – and patients are seen within two to four weeks. She has produced guidelines for the management of common arrhythmias. ‘These are supporting appropriate and timely discharge and reducing admissions by offering rapid access review,’ she says. ‘Our involvement in managing these patients and our offer of early follow-up reassures both patient and teams.’ Evaluation shows that 92% of patients are satisfied and are happy to see the nurse. ‘We are trying to keep them out of hospital and manage them in primary care where we can,’ she says. Her second innovation was a transient loss of consciousness (T-LoC) clinic, driven again by the poor journey her patients were experiencing as they were bounced between cardiology and neurology. Ms Hall explains: ‘Before the new clinic, if a patient went to their GP having collapsed or with dizziness they would be referred to neurology, with a nine-month wait. They would go back to the GP, presenting at the ED two months later. From there they would be referred to cardiology, experiencing a further four-month wait. ‘They would have two appointments, an ECG, 24-hour monitoring, echocardiogram, plus EEG and CT head scan. It would take three months for all the tests to be completed before the patient received a diagnosis of second degree type 2 heart block, with a pacemaker inserted four weeks later. The RCNi Nurse Awards judges were especially impressed by Ms Hall’s successful drive to introduce a new drug at Jersey General Hospital to treat rapid onset atrial fibrillation. After hearing about the drug at the Heart Rhythm Congress and researching the trials, Ms Hall gained support from the cardiologist before presenting it to the Drugs and Therapeutics Committee at the hospital. It was unanimously approved. nominated her for an award. ‘We haven’t had any new arrhythmia drugs for the past 40 or 50 years but vernakalant has a very high rate of conversion to sinus rhythm – up to 87% – and those patients are able to be discharged home from hospital,’ says Ms Hall. ‘This novel treatment has significant cost savings – the cost of the drug is much lower than a bed – and it avoids the risks associated with staying in hospital, so it is much better for patient outcomes. ‘I went through a long process of obtaining the drug, taking all the evidence through the drug and therapeutic committees and obtained the drug for local use. ‘When I first started and had to go to various governance groups, a couple of consultants were a bit against the nurse doing it, but that has come full circle and now they refer straight to me. ‘Staff in the emergency department would ask “how can we be confident in using this” but for the first ten or 20 patients I would go down regularly to discuss it with them and ask them to call me. Then I moved away so they became confident to use it independently. Now ten other centres across the UK have asked for her protocols and are going through their local procedures to get it as well. Ms Hall has also introduced screening for Brugada syndrome, an inherited cardiac arrhythmic condition that is a leading cause of death in people aged under 40. ‘Previously people had to travel off island but I did not want to accept things as they were – we are here to improve things for our patients,’ says Ms Hall. Ms Hall was nominated for an RCNi Nurse Award by a colleague, clinical nurse specialist Kellyanne Kinsella. Consultant cardiologist Andrew Mitchell says she is thoroughly deserving of the RCN Nurse of the Year title. ‘Angela is one of the most hard-working and dedicated individuals I have worked with across all health professions,’ he says. ‘Her high level of commitment and competence has transformed heart care for our local population. ‘Thanks to her passion for innovation, we have been able to set up rapid access heart rhythm and blackout clinics in Jersey, getting people out of hospital quickly and safely while permitting the appropriate and timely use of investigations and treatments. ‘In addition, Angela has established a nurse-delivered cardioversion service, with drugs adjusted and patients recalled when required. Thanks to her persistence and drive, she was able to source a new drug for atrial fibrillation management and develop a pathway that gave non-cardiology colleagues the confidence to prescribe it before it was in mainstream use in the UK,’ Mr Mitchell says. The RCNi Nurse Awards lead judge and chair of RCNi’s editorial board Caroline Shuldham says: ‘Angela was nominated by a colleague who described her as “a fantastic example of a nurse innovator”. The panel agreed wholeheartedly. Jersey health and social services chief nurse Rose Naylor says Ms Hall is a true inspiration to her colleagues and patients. ‘We are very proud of all that she has achieved and continues to achieve. She is always seeking ways to improve the care provided to her patients and advance her practice. She is a credit to nursing, her specialty and our department. Ms Hall says being named RCN Nurse of the Year feels like an incredible achievement, personally and professionally. ‘But it is also recognition for our service and nursing in Jersey,’ she adds. ‘We have worked very hard to improve our services for the benefit of patients, and I have very supportive colleagues.